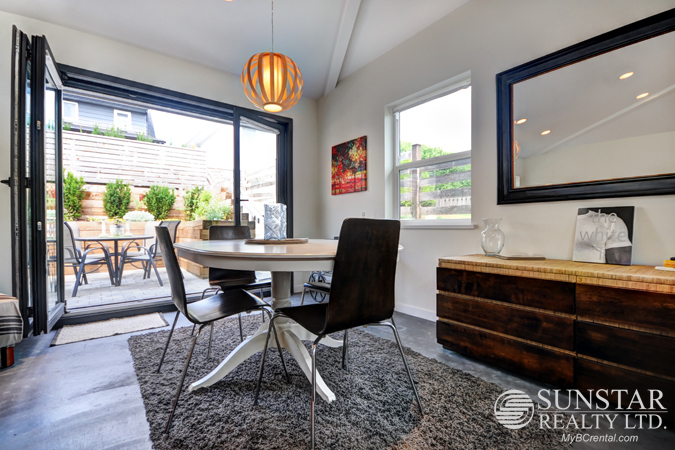 North Van Furnished Laneway House w/ Concrete Floors & Patio - $2995 — Lynn Swanson At a glance guide to all currently available fully furnished properties managed or represented by Sunstar Realty Ltd. Included items: fully furnished from cutlery to linens; from flat screen TV to designer soap dispensers; fridge, stove, dishwasher, microwave and washer/dryer; and also includes grounds maintenance, utilities, cable, and high speed wireless internet. Not included: long distance telephone & move-out clean. 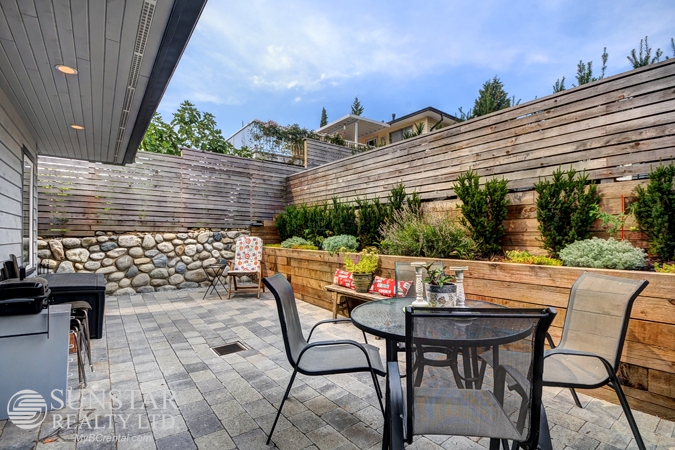 LOCATION: Well located stylish laneway house, situated in a well established neighborhood in the sunny Grand Boulevard area of North Vancouver, your RETREAT from the fray of busy downtown. Here you can enjoy numerous WALKING AND HIKING TRAILS nearby and up the mountain, or stroll to LOUTET FARMERS MARKET for fresh organic produce (grown in their garden) and sample some honey, made by their own bees. The North Shore has so much nature to enjoy and this home is in the heart of it. Brooksbank Elementary School and Daycare are one short block walk away. Loutet Park, encompassing several playing fields and playground, is a Â½ block walk. Newly renovated Sutherland High School, located 5 blocks walk. TRANSIT is excellent from this location, buses go direct to downtown and the SEABUS. (Buses to Downtown, Seabus, Capilano University and West Vancouver do not require transfers). Retail and grocery shopping available at Park and Tilford Mall, under a 5 minute drive south; retail shopping and Community Centre on Lonsdale Avenue accessible in 5 mins drive (or by bus which has a direct route to Lonsdale along 15th Street). Newly renovated Lynn Valley shopping Mall and Karen Magnussen Wave Pool, Ice Rink and gym a mere 5 minute drive. GROUSE MOUNTAIN a short 15-20 minute drive North. FEATURES: Why would you choose a condo? 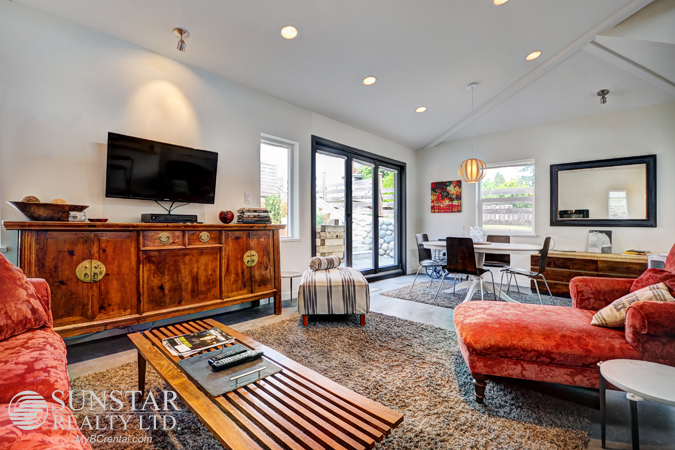 This gorgeous, CONTEMPORARY 810sf LANEWAY HOUSE offers so much more; PRIVACY, elegance, interior space and LARGE PRIVATE OUTDOOR SPACE and your own herb garden. Park right outside your door. NO PARKING GARAGE AND NO TREK TO THE ELEVATOR! 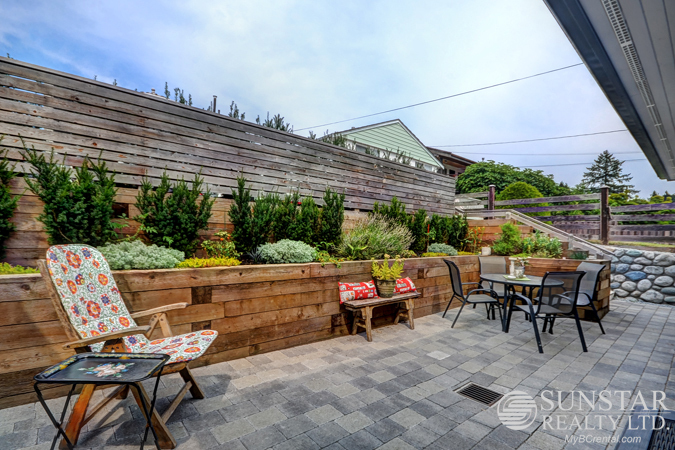 It's quiet and serene, yet you are CLOSE TO AMENITIES, parks and transit. Enter this architecturally designed home to a large open plan kitchen, living room and dining room. 16ft HIGH VAULTED CEILINGS enhance the spaciousness and clerestory windows let in the most beautiful soft light. Concrete floors throughout are radiant heated. Furnishings are an eclectic mix of modern and collected pieces and includes a 46" wall mount TV (with programmable device) and electric fireplace. Living room sofa and chaise are big and luxurious. 9 ft eclipse doors brings the outdoors in, opening to your private patio with table seating for 4, teak lounger and portable BBQ. Kitchen is equipped with stainless appliances including Samsung Gas range, microwave, dishwasher, and a variety of small appliances. Bedroom features a queen sized bed and TV. Bathroom is large enough for two to move around comfortably and includes combination tub/shower. Other features include new full size Samsung front load washer & dryer and hot water on demand. Sensor lighting around the perimeter of the home provides light on arrival. 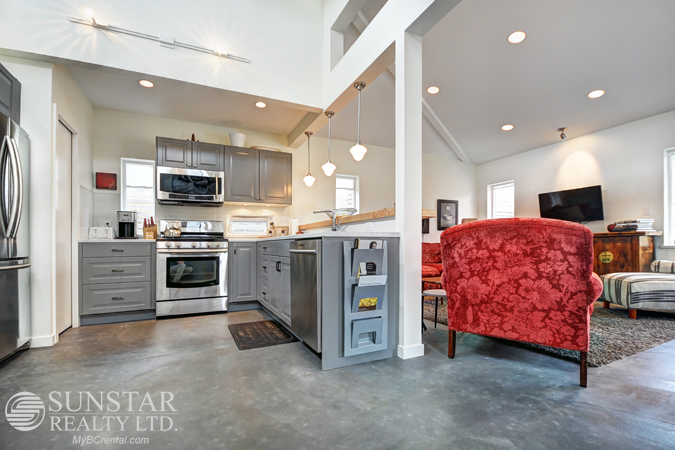 North Vancouver Furnished Laneway House - Sunstar Realty Ltd.